Can you believe my kids are already planing their Halloween costumes? It seems early to me, but at the same time I’d rather have more time to figure out how to create their costumes. I have one child with an October birthday. One year she had an amazing costume party with tons of easy crafts, decorations and scary food. The kids loved it! My kids still talk about that fun party. 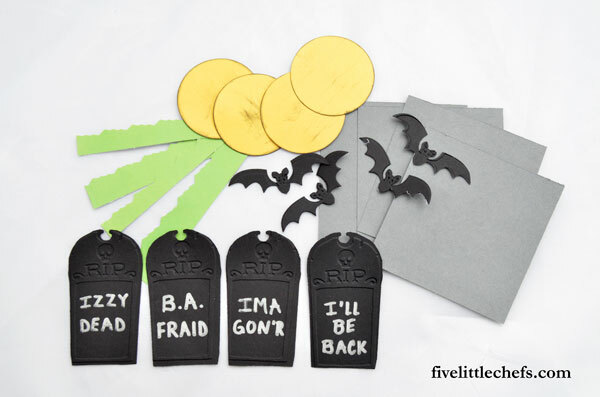 Today, Little Chef D had a fun time helping me create these Tombstone Halloween party favors. This is an easy craft because you are refacing the the party favor boxes from the Dollar Store. Cut out a gray 3×3 square. Punch out one yellow circle. Using the back stamp pad ink the edges of the moon. Little Chef D wanted to ink a little over the top of the moon to make it more scary like it is covered with fog. Cut some green grass 3″ long and 1/2″ wide. I used decorative scissors called “leaves.” You could always use a zig zag or free hand grass if you wish. 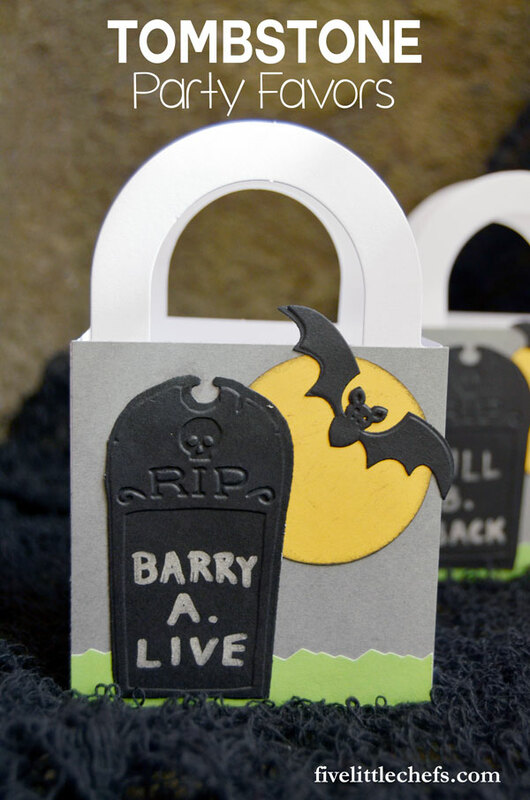 Using black cardstock cut and emboss the tombstone and the small bat. If you like the larger bat go ahead and use that. Write an inscription on the tombstone with a silver sharpie. To assemble: Glue the grass on the bottom, then the moon at the top, next comes the tombstone and then the bat. Take a look at the image to see the placement of each piece. 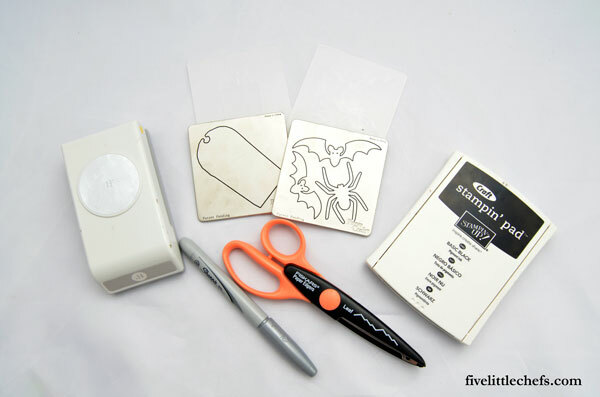 Glue the 3×3 square onto the party favor box. I found these boxes in the wedding section. I forgot to include them in the supplies picture. I need to add a picture here so you know what I’m talking about tonight. Assemble the box. Fill it with your desired treats/favors. With the help of Little Chef D we were able to get these halloween party favors done quickly. Now to plan the next part of the party! 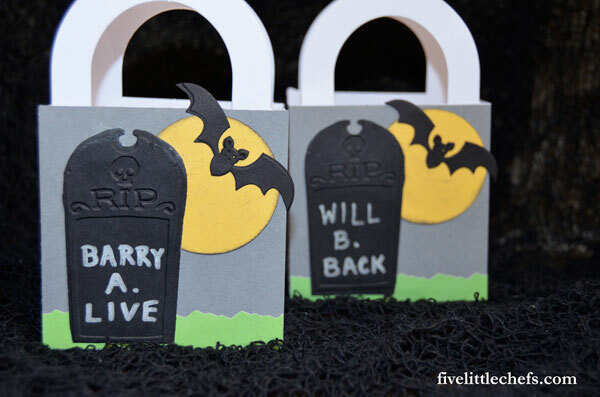 2 Replies to "Tombstone Halloween Party Favors"
OH my gosh…so adorable! LOVE! to create a top notch article… but what can I say… I put things of a lot and never seem to get anything done.